Traveller's Tales: The Best Restaurant in the USA? Gourmet magazine's Top 50 Restuarants in the USA puts Alinea at #1. 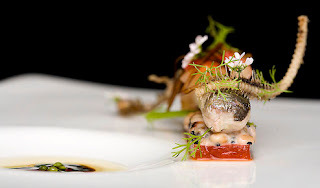 This Chicago-based restaurant is owned and run by chef Grant Achatz who once worked as Thomas Keller's sous-chef at the French Laundry and even spent a week cooking at El Bulli (check my post on The World's Best Restaurant). Says Gayot, "Alinea should charge you just to tour the place, to soak up the atmosphere and pick up some very smart decorating tips. But it’s not the décor that causes foodies to fly in to dine here. This is kaiseki dining Western-style from chef Grant Achatz. In other words, multi-courses of magnificent morsels that are cunningly (and sometimes whimsically) crafted, elegantly presented, and joyfully consumed in a setting that is so comfortable that it squeaks." Here are some pictures of the work of art you are expected to eat in this restaurant. Alinea seats 70 people at 20 tables; meals consist of either a 12-course tasting menu or a 24-course "tour," and can last up to four hours. The 12-course dinner is priced at $135 and the 24-course dinner will put you back by $195. The wine pairings are separately priced. The cuisine at Alinea bears the torch in America for what is known as molecular gastronomy. Consensus seems to be that Ferran Adria, the godfather of this movement is a genius. 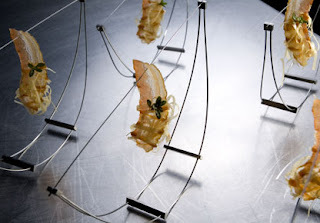 Adria's restaurant El Bulli is radical in it's experiment with flavors, taste and is not for the faint-hearted. Alinea, on the other hand, uses the same philosophy of applying modern science to culinary problems, yet follows conventional wisdom on flavor and taste. This restaurant is currently among the top two American restaurants on my wish-list, the other one being The French Laundry in Napa Valley, California. 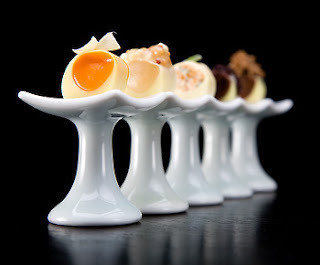 oh mine too... it is on my to-try list... Molecular gastronomy is an amazing art/science. Have you seen their sunny-side up dish made of carrots and coconut cream, it is awesome! wow, sure looks fascinating! though being a vegetarian, I don't know if I'd have much choices to eat:) hehehe..
but we love trying new eateries, and I keep posting reviews on my favorite restaurants, though I'm falling behind! @mansi: You are right. I think they do have a vegetarian option, but may not be all that great. I will visit you blog; would love to see your reviews too.